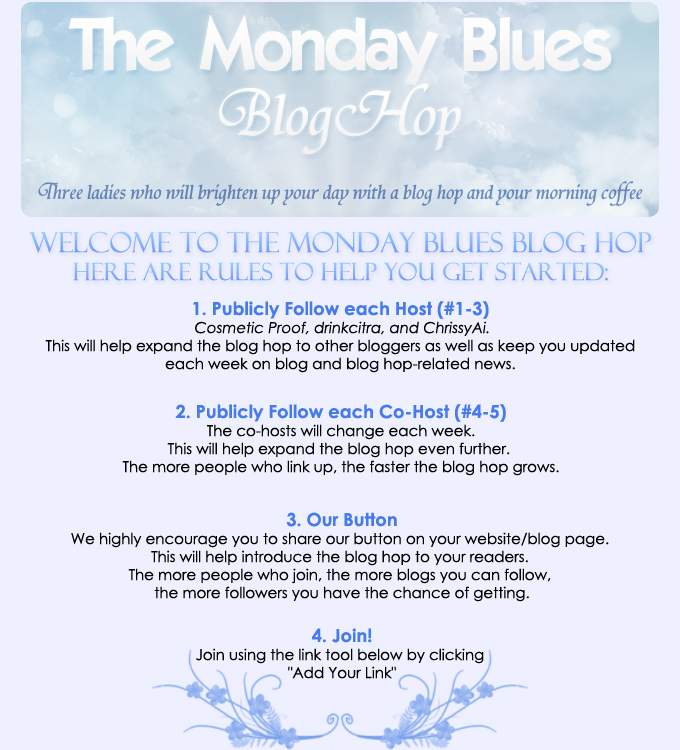 Welcome to the launch of The Monday Blues Blog Hop! This blog hop is hosted by Traci from drinkcitra, Jayne of Cosmetic Proof, and of course myself. Mondays typically aren't the best day of the week and our goal is to help make yours better! Aren't sure what a blog hop is? Basically, the gist of it is you leave your blog name and link on the list below. Other people joining the blog hop will easily be able to see and access your blog simply by clicking the link. You get the full experience of a blog hop by not only leaving your link below but by visiting blogs, following, and leaving comments! This will help you be able to find new blogs as well as allow other bloggers to find you. What are you waiting for? Join in, hop around, and let your Monday blues melt away! If you're interested in being a co-host next week, send us an e-mail at mondaybluesbloghop@gmail.com! I've just hopped on, looking forward to finding some new blogs to read! Awesome! No problem, thank you for joining!